Learn more about the film from production designer, Nelson Coates. Based on the best-selling book of the same name by Kevin Kwan, Crazy Rich Asians had a star-studded Hollywood premiere last night and hits theaters on August 15th. 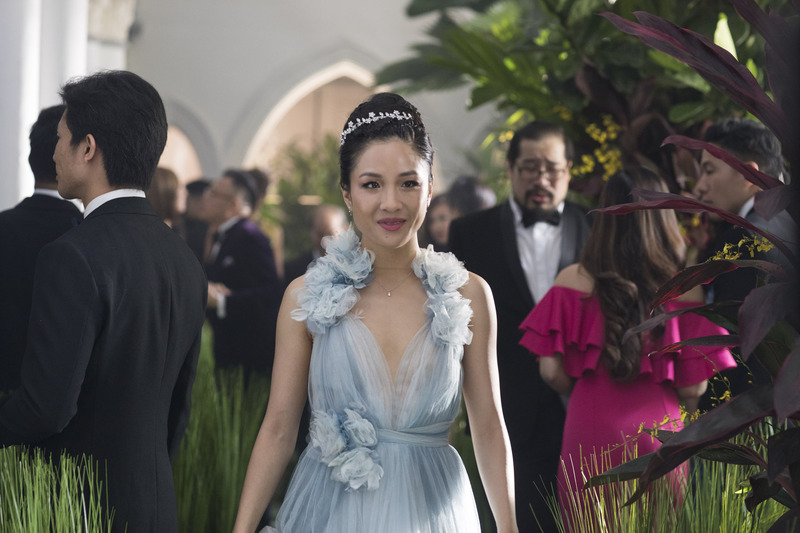 For fans of the novel, the new movie is much anticipated, and even those who didn't read the book are sure to love the story of Rachel Chu (played by Constance Wu), a young Asian-American woman, who finds out her boyfriend Nick Young's (Henry Golding) family is one of the wealthiest families in Asia. She visits Singapore with Nick for his best friend's wedding and the drama unfolds once she meets his family for the first time. 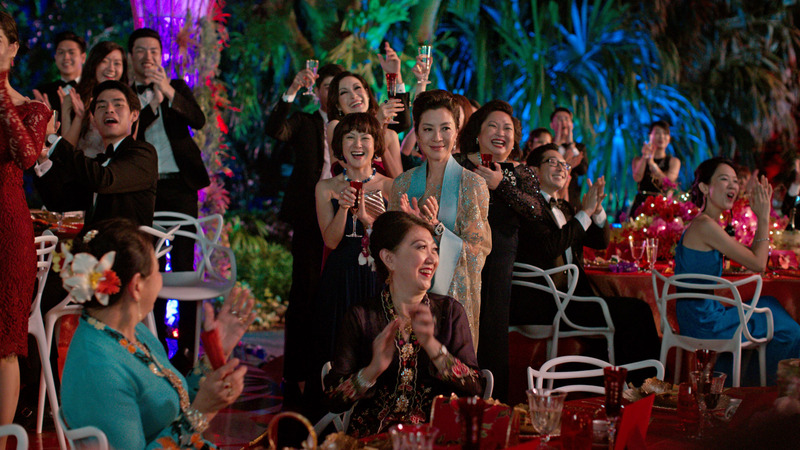 Since the plot of both the book and subsequent movie is based around a luxurious wedding, we asked Nelson Coates, the production designer of Crazy Rich Asians, to share some behind the scenes details about the making of the extravagant wedding scene, as well as the inspiration behind the design. Read the Q&A below to find out more and maybe even inspire your own nuptials! Inside Weddings: What was your inspiration for the wedding in the movie? IW: Was the wedding designed as it was detailed in the book, or did you create the wedding décor scheme from scratch? NC: The wedding décor is basically from scratch, though the over-the-top bespoke qualities of the wedding and Kevin Kwan’s meticulous attention to detail in the book definitely influenced us to go even further in the film. IW: What was the biggest challenge when designing the wedding for the movie? NC: The grasses would be challenging… how to accommodate guests and seating, while moving cameras or actors anywhere… with quick restoration. The awesome Aussie & Malay greens crew searched worldwide for 36-inch tall artificial grasses, which retained their shape without flopping over. The entire church floor would be covered with painted pegboard, then grasses installed. We could move seating and grasses anywhere to allow the camera crane and lighting to move around, and then redress in front of the camera to look perfect again. To keep chair backs from interrupting the meadow look, we built freeform unholstered benches in moss green velvets to look high-end yet disappear into the grass. Bromeliads, orchids, and truckloads of tropicals, heliconias, and gingers were located and rented or purchased from nurseries all over Singapore. Like with any wedding venue, we faced a scheduling crunch. CHIJMES, a church fixture in downtown Singapore since 1904, was classic and beautiful, and said yes to filming, but only had a five-day window available during the Singapore portion of our shoot... Only five days to install the set, dressing, and greenery, rehearse actors, film the wedding, wrap the interior, and film exterior wedding arrivals. Every constructed element was fabricated at a soundstage where we rehearsed the grass installation and moon gate assembly. IW: Were there any real weddings (celebrities, friends, etc.) you looked to for inspiration? NC: I looked at hundreds of wedding images from royals to dynastic families to see how this one could be unique. The look always starts with a good venue. The challenge was how to make this one specific to a region and to our story. Just filling a church with lots of flowers or “stuff” doesn’t make for a particularly unique or one-of-a-kind wedding. The hope was to visually reinforce the exclusivity of the event and create a culturally rich and unique story-specific experience, with lots of wow factors, while at the same time maintaining an intimacy for the emotional story beats that our director and cast was creating. IW: What is your favorite wedding from another movie? NC: Well I am a bit partial to a couple of other movie weddings I have designed, such as the barn wedding in The Proposal, and the wedding in Fifty Shades Freed – but I really loved the colors, magic, and feeling of Monsoon Wedding, and the history and dynamics of The Godfather. IW: What cultural elements did you use for the wedding design? NC: We used numerous cultural elements for the wedding design of Crazy Rich Asians. In addition to traditional tropical florals, the wedding needed a focal point unlike any I had seen inside a church. I pitched Jon (the director) the idea of a classic stone Chinese moon gate for the center of the stage, flanked by eight-foot oversized “bamboo” fans. The constructed fans include traditional Chinese dragons serving as the background for the musicians and groomsmen. We also fabricated numerous bamboo and linen fabric lanterns adorned with traditional patterns and ancestral illustrations related to blessings of fertility, prosperity, and happiness. Artisans still practicing the centuries-old craft fabricated and painted [them] by hand, each lantern requiring two to three weeks to complete. IW: What’s the difference between designing a wedding set versus an actual wedding? NC: Designing wedding scenes for movies is in many ways quite similar to real-world weddings. Choosing a location and theme, flowers and other décor, invitations and programs, seating, the music… all those decisions still have to be made. Some major differences do exist though, such as if the scene requires several days to film, then flowers, food, and costumes have to be refreshed, and the crew has to make everything look like no time has passed. Also everything has to be able to move to accommodate camera positions, the order of filming, and the repositioning of crew and equipment to get each shot. Ways to hide lighting rigs and other equipment have to be carefully thought through. IW: What was your favorite detail from the wedding that you hope viewers will appreciate? NC: Our props team fabricated hundreds of copper wire handcrafted butterflies and fireflies on artificial “branches,” highlighted with LEDs, for guests to lift out of the grasses as the bride walked down the aisle. The lighted branches created a special moment [and] made the reveal of the bride “walking on water” look even more breathtaking. 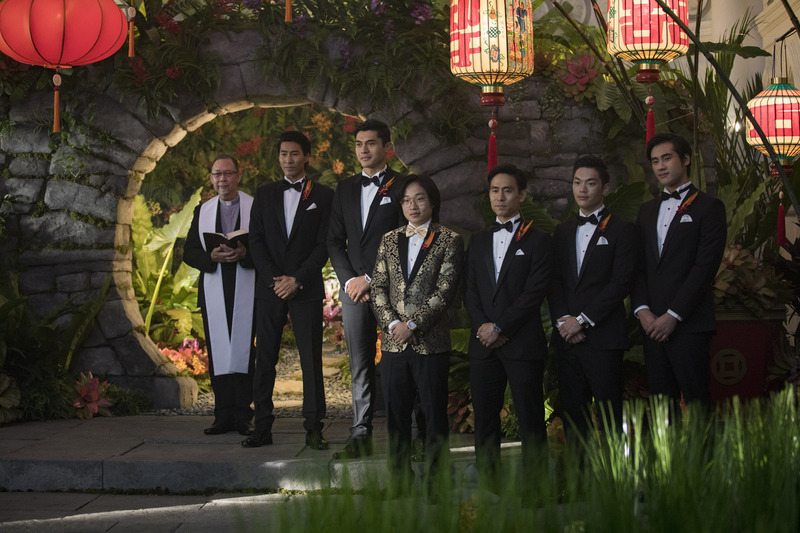 Take a look at the trailer for Crazy Rich Asians below, and see the wedding scene for yourself when the movie hits theaters on August 15th! For more wedding inspiration, check out hundreds of real weddings from across the country, start putting together your wedding team here, and view inspiring photos from real weddings by your desired color palette.